There are many summer festivals in Venice, so many, and fortunately (we’ve already spoken of some in other blog posts.) every festival is special in its atmosphere and traditions. These appointments mark the Summer Venetian Nights with music, gastronomic stands and lots of fun for those who live in Venice. The whole archipelago of the Venetian Lagoon ignites with celebrations and festivals during this season. From Pellestrina to Malamocco, From Mazzorbo to Alberoni. The Venetian territory is fermenting in excitement from May to September, between typical food, and rivers of Prosecco and tasty fish. But venturing just a little farther away while remaining close, near the meridional waters of the lagoon, is the beautiful island of Chioggia (here you can read some particularities of the place on the this blog post) where among many things, every year- for the past 80 years- the much celebrated Fish festival is celebrated. 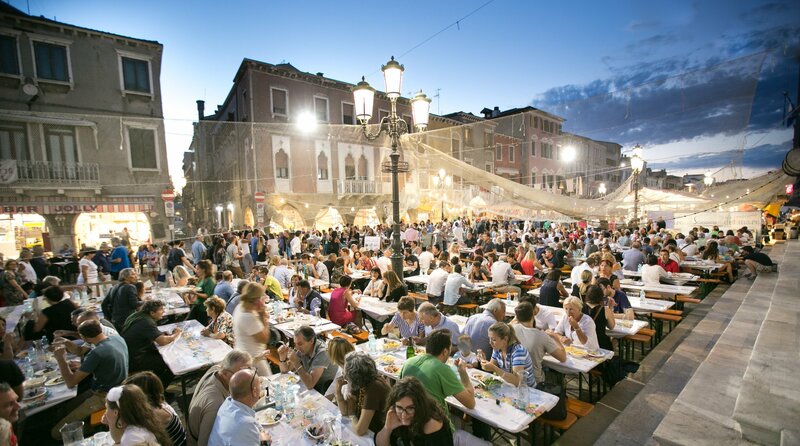 The main street in Chioggia becomes the center of the gigantic manifestation (this year beginning from the 13th to the 22nd of July) and is dedicated to uncovering the local fish and traditional plates. Chioggiotti (people from Chioggia), Venetians and tourists crowd the long street of Corso del Popolo and the adjacent Rios to order the mix of fried seafood, mussels aka peoci made cassopipa style, scallops, fasolari, and many more delicacies from the sea. Many of the gastronomic stands, each have their own specialities, and there are hundreds of places to sit and a huge turn around every night. This night is one of the most celebrated festivals and a perfect occasion to discover the city’s rich history and traditions, wonderful atmosphere and great food.